How does your expense reporting process stack up? Answer three quick multi-choice questions to see how your organization compares to your peers. Have you used a Concur product at a previous employer? If you could change one thing about your expense reporting process right now, what would it be? What is your current process for expense reporting? Find out how your organization's expense reporting process compares to your peers. Receive the IDC White Paper: Driving Business Value through Travel and Expense Management Maturity, sponsored by Concur. 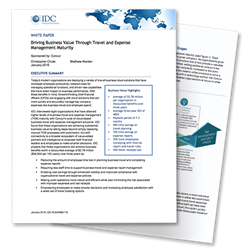 See where your organization fits into the five stages of travel and expense management maturity and learn how moving to and beyond automation can drive business value. Complete the form to see how you stack up. Learn how moving to and beyond automation can drive business value. ©2019 Concur, all rights reserved. Concur is a registered trademark of Concur Technologies, Inc.